Nowadays, robotics and automation had been leading edge of our technology. For centuries, we refer to nature as a guideline for our innovation and breakthrough. We already have robotic insect, snake and fish. So what’s next? How about a bird, which obviously look like a bird and surprisingly, flew like one! 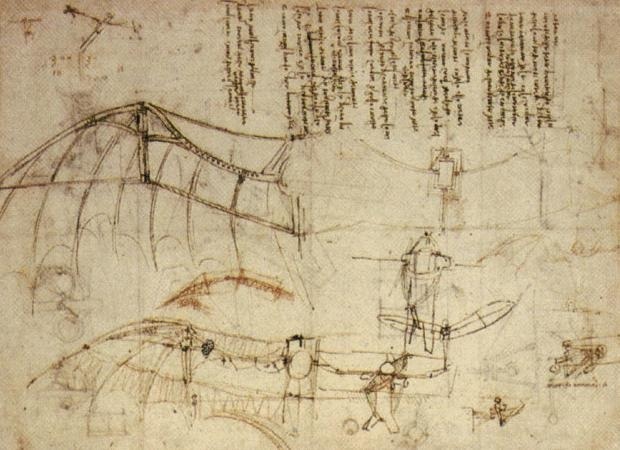 Festo, a German high-tech automation company had perfected what Leonardo da Vinci sketch in year 1505. Ah... those were the years where crazy inventions took places in our history. Festo has managed to almost perfectly translate the elegant movements of a bird in flight into a flying robot that looks like a seagull. Bird does not just flapping their wings; it twists also to give lift during flight. This robotic bird, equipped with 485 gram of servo motors which enable the wings to flap and twist at specific angles - that allows the bird to rise in the air by flapping its wings alone. It is able to start, take off and land unassisted, with the head and tail acting as a rudder to steer the bird through the air. If you thinking there are propeller blade like a RC plane, you are so wrong. Check the video below. Built from carbon fiber and polyurethane foam, it has a wingspan width of nearly 2 meters long and powered by 23 watts LiPo accumulator cells. It can be control by 868 MHz/2.4 GHz two-way radio transmission. Yes, RC plane is so old news. As you can see, the internal mechanics look similar to da Vinci design, and Festo in fact did references da Vinci's "rudimentary flapping wing models" as part of its inspiration. Ok, moving wings is one thing, but to study air created by it, this is when SolidWorks to do the job. To understand how SolidWorks get into work with this robotic bird design, we need to understand that real bird have a complex of motion to create aerodynamic force which able it to fly. Below are the sequences of that motion captured in time frame. 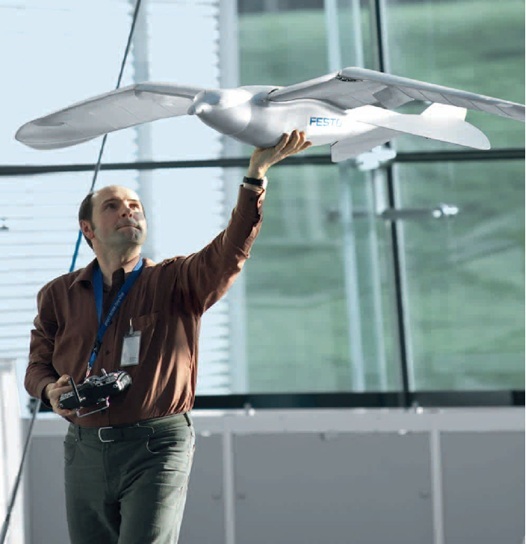 With requirement of lightweight bones, rigid skeleton, streamlined body of all birds, the most important key aspect is the wing, which creates the lifting force. The shape of a bird’s wing is important for producing lift. The increased speed over a curved, larger wing area creates a longer path of air. This means the air is moving more quickly over the top surface of the wing, reducing air pressure on the top of the wing and creating lift. Also, the angle of the wing (tilted) deflects air downwards, causing a reaction force in the opposite direction and creating lift. Larger wings produce greater lift than smaller wings. Notice the underlined word 'air is moving' and 'pressure' on above text. Both of that can be simulate by SolidWorks Flow Simulation in virtual environment. 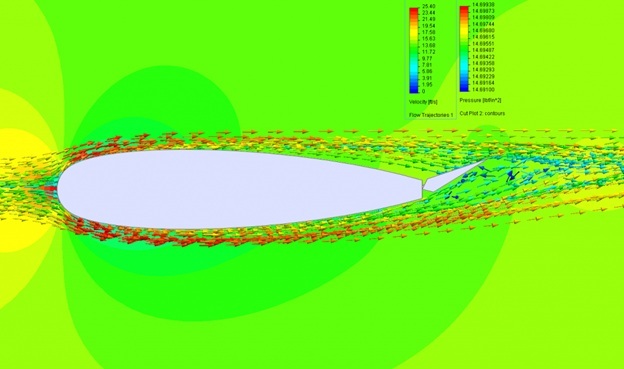 SolidWorks Flow Simulation takes the complexity out of computational fluid dynamics. You can quickly and easily simulate fluid flow, heat transfer, and fluid forces that are critical to the success of your design. Simulate liquid and gas flow in real world conditions, run “what if” scenarios, and quickly analyze the effects of fluid flow, heat transfer, and related forces on immersed or surrounding components. Design variations can be compared to make better decisions, resulting in products with superior performance. Additional valuable modules, HVAC and electronic cooling, offer dedicated fluid flow simulation tools so you can go to the next level for your analysis. Here are the results of SolidWorks Flow Simulation. The colored arrows indicate the velocity & pressure of traveling air upon contact with the wing. 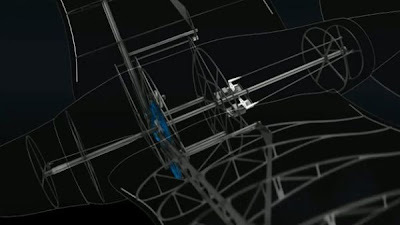 From this we could know that the wing design could or could not provide sufficient lift force for the bird, relative to weight during takeoff or in midflight. As conclusion, it’s true that main idea of design came from nature, but to have it been done in smart and less time consuming way, it have to be perfected by SolidWorks.